So now that I have the 13 touring nearly done I want to start on a 64 Galaxie Convertible but I need a front bow and haven't seen anywhere to purchase Any suggestions out there? Robert, I can't help, but I sure can sympathize. I have had TWO 63 Galaxie 500 convertibles, which use the same front bow as yours. I think 62 did, also. Both were factory R engine code cars. The first one was built in the Dallas plant and the second in Wixon, MI. The second car had been sheltered all its life and had less than 55,000 miles on it when I bought it. The Dallas car hadn't been sheltered, but also had about 55,000 miles on it, and it was evident that it had also seen the Gulf of Mexico beaches at Galveston, as the rear quarters had rust out and the front top bow wasn't even strong enough to stay together when the top was lifted. Until I got the second rust free car, I liberally applied fiberglass resin and matting to the front bow to try to keep it, together. I don't know if they are reproduced. I doubt it. I would check Hemmings; advertise on major western cities' Craigslist; put out 'feelers' to major western state's restoration shops and wrecking yards; and be ready to travel to inspect it before buying. Terry, Over 25 years ago we bought a fiberglass bow from a company in Cincinnati, OH for our 63. At that time we did not own a 64 or we would have bought two. That company has been out of business for many years now. If 62, 63 and 64 are the same we may be able to patch one together if necessary but they likely rust in the same places. Thanks for the reply. You might also want to check part numbers for Thunderbird. The windshield frames are similar to Galaxie's. If the part numbers are the same, that gives you another pool of part suppliers to search. 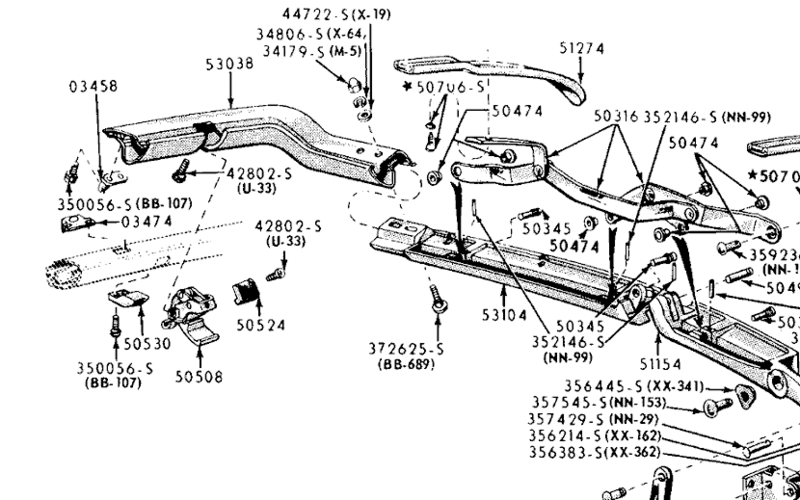 I have a '64 Thunderbird convertible and I might have a part number on a CD. If I find it, I will let you know. It looks like you need C3AZ-7653038-A according to my parts book. But, please verify before purchase. I hope you can view these bitmaps. If not, let me know and I will send a PM. WOW ! I didn't know Greg Donahue was out of business. I used to buy from him regularly. Mark, thanks for the pics. They are clear. I took a screen shot of them for further use. Duey, Thanks for the detail shot and RJ, I will check out Buds. Put an ad on Fordbarn.com in the late V8 wanted section or ask on the same site late V8 forum if anyone makes them.